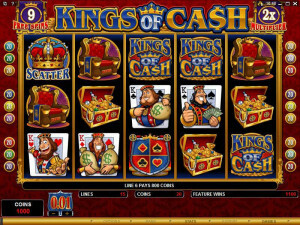 Quite a charming slot machine, Kings of Cash was designed by the guys from Microgaming, and this is clearly one of their better looking slots. 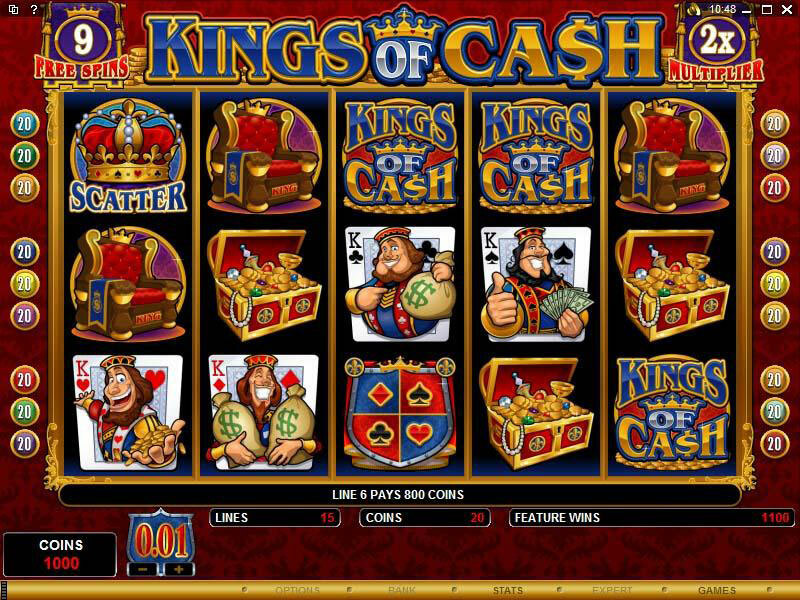 Themed around the King that you see on playing cards, he appears here in various positions, but always holding money in his hands, either in the form of cash, money bags or gold coins. The same treasure theme repeats itself in the rest of the symbols as well, and it’s all done very tastefully and with lots of animations and details. Even the features look quite good, as you will discover by reading the rest of the review. 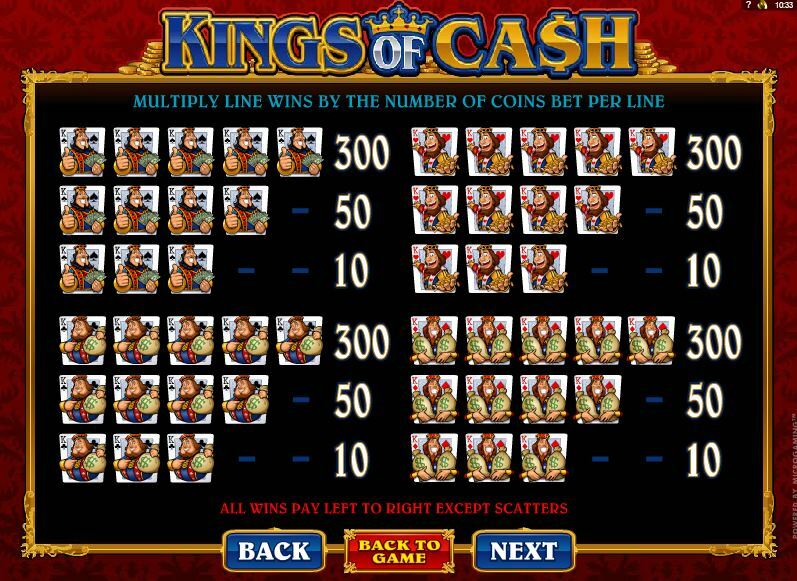 With 5 reels and 15 lines, Kings of Cash seems like a very typical slot machine in that regard, though the graphics do insure that it’s not all average. 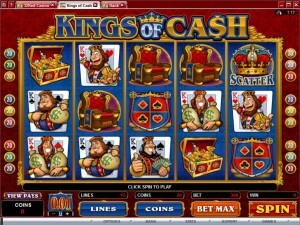 There are bonus games in this game, along with free spins, multipliers and wilds. The payouts reach top values of $25,000. The game has two types of scatter symbols, plus one wild. 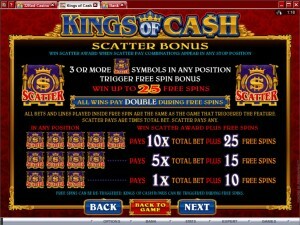 The scatters will trigger free spins with multipliers or bonus games for you. This part of the game is just as good as the design. One of the most common types of features in modern slots would be the wild symbol, and it often has two roles. First of all, it helps you make more money by substituting for other symbols and bringing you more wins in the long run. It does this by acting as a bit of a Joker, or at least how a Joker would behave in a card game. When it’s not in a position to help you out, the wild will not be of any use, but more often than not it will be of some help with at least one combination. 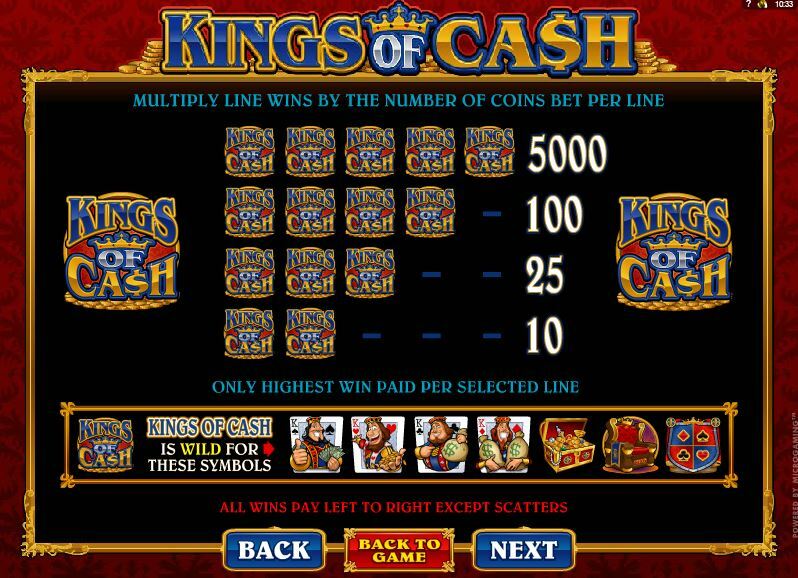 The wild also gets the role of the top jackpot trigger, and this happens quite often, so it’s no surprise that it does the same thing in Kings of Cash. The symbol used for the wild feature is that of the game logo. The first of the scatter symbols is with the image of a purple flag, with the coat of arms painted on it being a combination of crowns and dollar signs in a gold color. 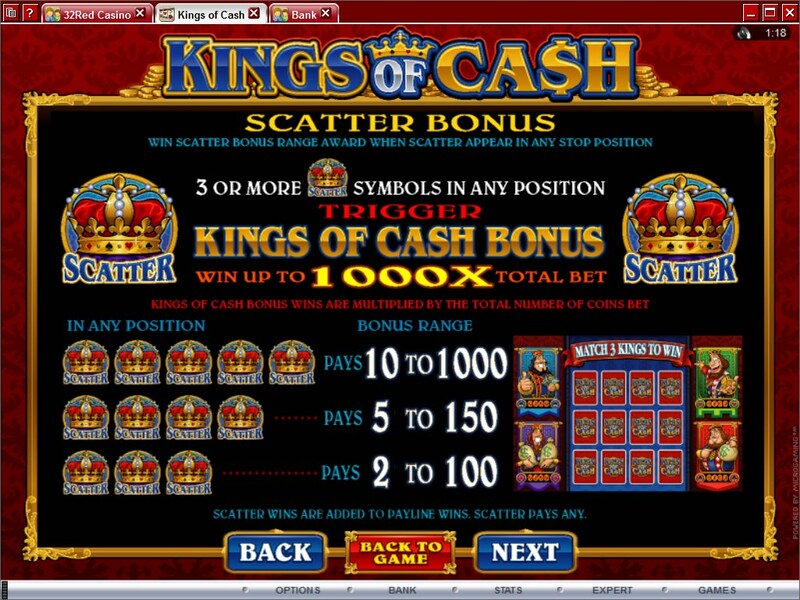 This scatter symbol triggers free spins whenever 3 or more symbols appear on the reels, whatever their positions may be. All free spins get 2x multipliers for their payouts, but the direct cash prize and the number of free games varies based on how many triggering scatters there are. 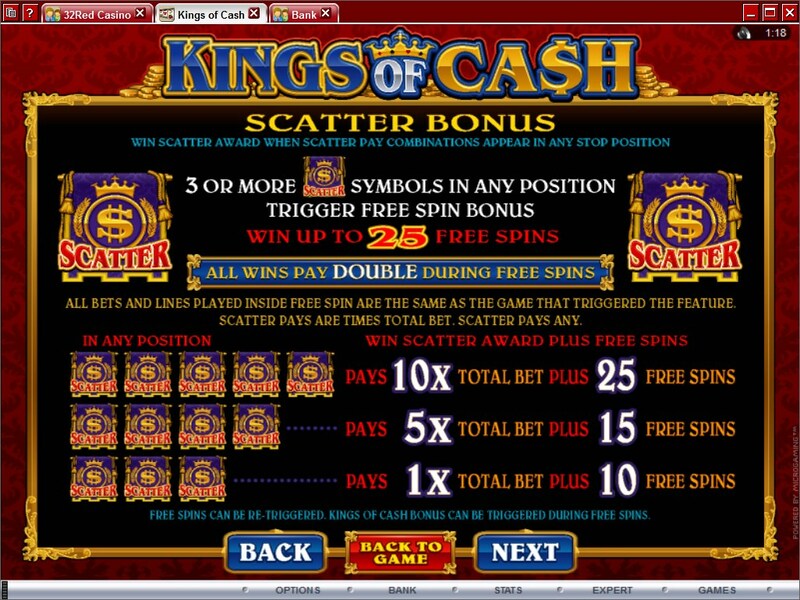 The minimum of three scatter symbols will bring you a small prize, worth the same as the bet that round, plus 10 spins for free. 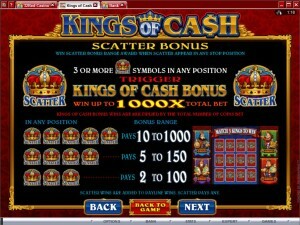 Four scatter symbols will award 5x the total bet, plus 15 free games. 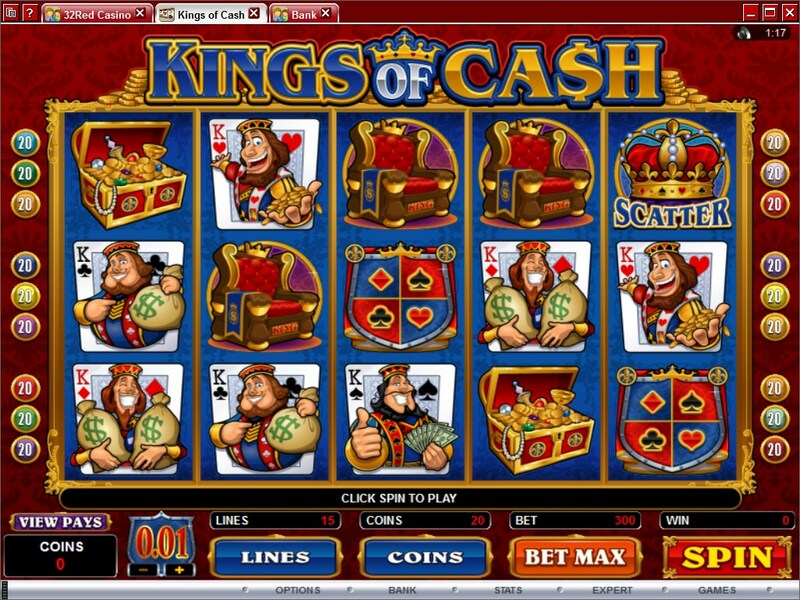 The maximum of five scatters will bring you the biggest rewards, worth 10x the bet plus 25 free spins. The second scatter symbol is the one with the King’s Crown on it. Since it’s a scatter, its appearance can be in any random position, as there is no need here to form regular combinations. The simple presence of three or more Crowns will be sufficient to start the feature. The game asks you to pick cards out of the 12 available on the screen. 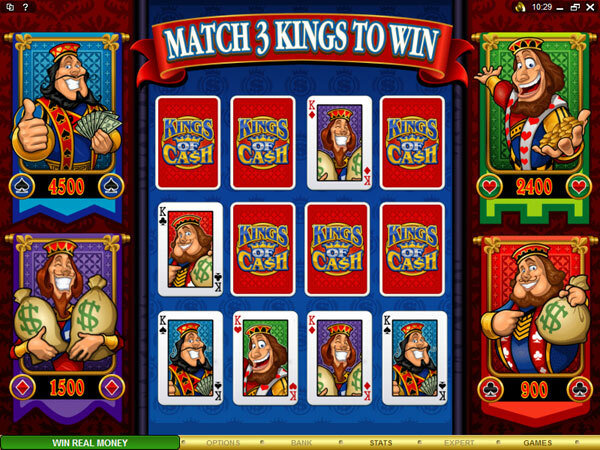 You have to find three matching kings, and once that happens the bonus game ends. 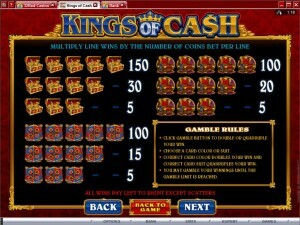 Depending on your luck, you can get smaller prizes, or you can win up to 1,000 times the total bet. Three scatters can get you 2x to 100x the bet, while four scatters award 5x to 150x and five will bring you 10x to 1,000x. 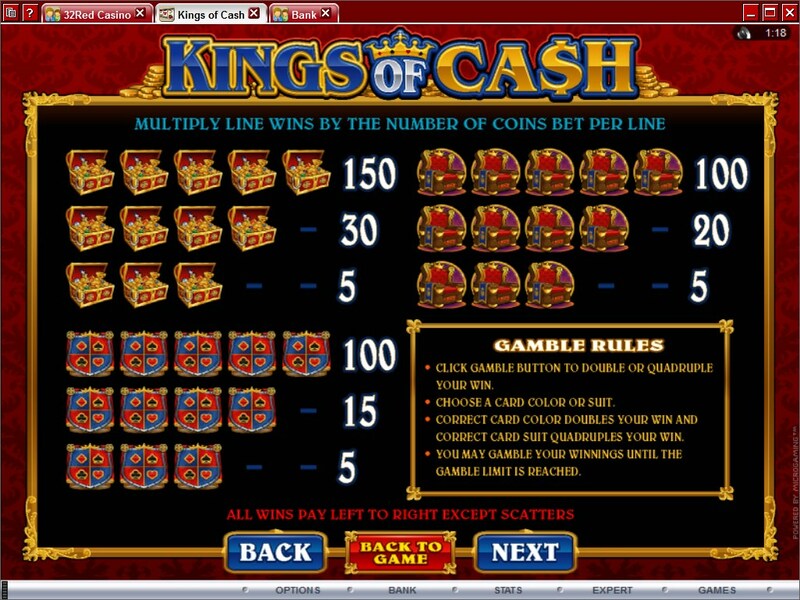 In the game, the bets are placed on as many lines as you want, the limit being 15 of course. 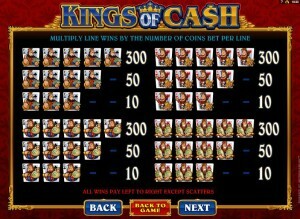 Each line accepts up to 20 coins in the bet, with denominations going up to $0.25. You can spend $5 per line, or up to $75 total. 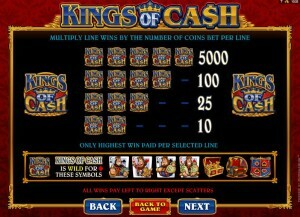 The wild symbol offers one of the bigger prizes in Kings of Cash, with 5,000x the line bet, or up to 100,000 coins. With the highest denomination used, that’s up to $25,000. That’s not the biggest possible payout of the game though, the bonus game promising to give up to 1,000x the bet, which would mean up to $75,000. The design is one of the best parts about this game. It has a rich dark red background image behind the reels, looking like some very luxurious velvet. On the reels, there are all sorts of treasure or playing card related images with kings on them. They’re excellently designed, and they each have their own small animation that triggers when they’re in a winning combination. It’s a lot of fun to play thanks to the well designed visuals. Symbols: Logo (wild, 5,000x), Crown (bonus), Royal Banner (scatter, 10x total bet), King of Spade (300x), King of Hearts (300x), King of Clubs (300x), King of Diamond (300x), Treasure Chest (150x), Throne (100x) and Crest (100x). It’s a very pleasant title, with a theme that contributes a lot along with the features that were introduced in it. It’s definitely worth paying attention to, as it’s a good game and you’re going to have fun playing it. 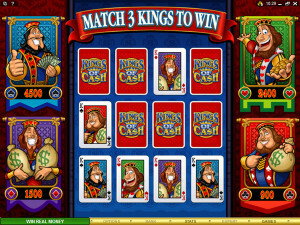 Kings of Cash can be found at any Microgaming casino, where you get a chance to play it for real money or in free mode.